Through its publications, the Arizona Historical Society promotes new research and scholarship about the history of Arizona and the surrounding region. As the leading publication dedicated to the state’s history, the quarterly Journal of Arizona History publishes articles that add substantially to our knowledge of Arizona’s past. In addition, the Arizona Historical Society maintains a book publishing platform. For information about the books AHS has published, see the catalogue. A 10% discount is given to AHS Members. A 40% wholesale discount is given to books vendors and individuals ordering 5 or more books. For ordering inquiries please contact us at [email protected] or at (520) 617-1166. 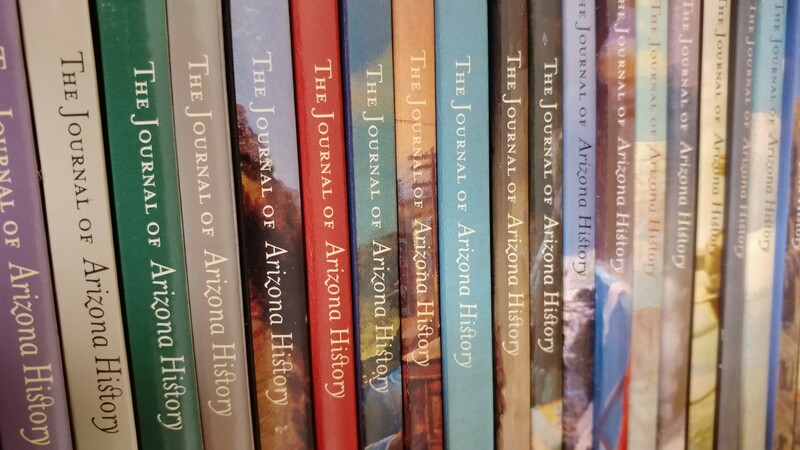 Each issue of The Journal of Arizona History features original research articles and an extensive book review section that focuses on new works on Arizona, the American West, and the border region. A subscription to the journal is a benefit of Arizona Historical Society membership. Members also receive access to archived issues through JSTOR. Single issues can be purchased as well. Recent issues (2015-present) are $12.50 per copy. Back issues (1960-2014), if available, are $7.00 per copy. To order, call the Publications office at 520-617-1163 or email [email protected]. The full list of membership benefits, plus an option to join or renew online, appears on our membership webpage. You may also access the Journal’s cumulative index. To submit an article manuscript to The Journal of Arizona History, contact the editor, Dr. David Turpie, at [email protected]. Authors are encouraged to read the submission guidelines before submitting a manuscript. Since 1975, the Arizona Historical Society has published more than twenty-five books about the culture and history of Arizona and the surrounding region. A full catalogue is available here. To order an AHS book, complete the Book Order Form. Online store opening soon! To purchase, call the Publications office at 520-617-1163 or email [email protected]. manhunt for her kidnappers, and Hoover’s obsessive involvement in the case. We are currently accepting book proposals. Authors should send a 5–7 page proposal that includes a discussion of the scope and content of the work, the proposed length of the book manuscript, the intended audience, and the timeframe for completion. Please submit book proposals to Dr. David Turpie, at [email protected]. They may also be mailed via postal mail to his attention at the Arizona Historical Society, 949 E. 2nd Street, Tucson, Arizona 85719.